The steel cutting ceremony for the first Saar 6 (Sa'ar 6) corvette ordered by Israel at the ThyssenKrupp Marine Systems (TKMS) shipyard in Kiel, Germany on February 7, 2018. The low key ceremony (no media representatives were admitted) took place in presence of the chief of the Israeli Navy, Admiral Eli Sharvit, and German Navy inspector Vice-admiral Andreas Krause. Saab has received an order from the Swedish Defence Materiel Administration, FMV, to provide Multi Tactical Data Links to the Swedish Navy. The total order value is SEK 148 million. The Russian Defense Ministry traditionally held the single arms acceptance day under the chairmanship of Defense Minister Sergey Shoigu to report on supplied military products and built infrastructure of the armed forces. The results showed that the renewal of the Russian Navy is progressing at a low pace, the Independent Military Review said. For the first time ever a giant RAF Chinook helicopter has been stowed in the hangar of a British aircraft carrier. With the nose protruding over the edge of one of HMS Queen Elizabeth’s two mighty aircraft lifts, the 99ft-long helicopter from RAF 7 Squadron was moved from the flight to the hangar deck. 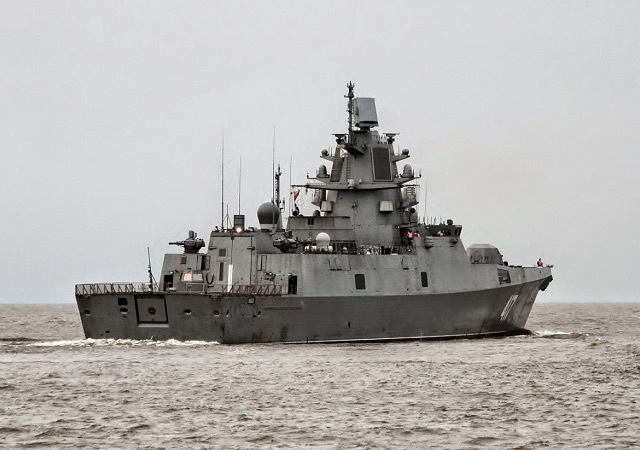 The latest and future Russian distant sea zone frigates of projects 22350 and 22350M will be equipped with unmanned surface and underwater craft for reconnaissance and inspection of vessels, operations on the seabed and studies of sea hydrology. Experts believe the craft will considerably enhance the effectiveness of frigates, the Izvestia daily writes. Hyundai Heavy Industries (HHI) started construction of the Royal New Zealand Navy (RNZN) future fleet tanker HMNZS Aotearoa. The first steel cutting ceremony took place on January 31st 2018 at HHI's Ulsan shipyard in South Korea. Russian seaborne aircraft and helicopters will be equipped with unmanned surface vehicles (USV) and will control them from an altitude of several kilometers. The unmanned vehicles will help the aircraft and helicopters search for adversary submarines, inspect floating craft, detect mines and rescue crews in distress. Experts believe the unmanned vehicles will enhance the capabilities of Russian antisubmarine aviation, the Izvestia daily writes. The Royal Navy's new aircraft carrier HMS Queen Elizabeth arrived in Gibraltar today for her first overseas port visit. The 65,000-tonne future flagship will be conducting a routine logistics stop having left her home in Portsmouth last week for helicopter trials. These helicopter trials take place before the fixed wing F35 Lightning II trials later this year. The Ivan Khurs communication vessel of project 18280 built by the Severnaya Verf shipyard sailed out to the Baltic Sea for running trials, the shipyard said. The U.S. Navy has selected BAE Systems to provide equipment and support services for Space and Naval Warfare Systems Center Atlantic (SPAWAR). As one of several companies involved, BAE Systems will pursue future orders as part of this five-year indefinite delivery, indefinite quantity (IDIQ) contract. Talks are under way to discuss the delivery of additional Russian-made equipment for Egypt’s Mistral-class amphibious assault ships, Russian presidential aide for military and technical cooperation Vladimir Kozhin told the Kommersant business daily. According to the 2019-2025 military planning law released today, France will study the integration of Aster 30 B1NT missiles aboard Air Defense Frigates, providing them with Ballistic Missile Defence (BMD) capability. Enfin! (At last!) France is set to launch studies on the replacement of the sole aircraft carrier of the French Navy (Marine Nationale). The Charles de Gaulle will be decommissioned by 2040, according to the 2019-2025 military planning law which will be presented tomorrow in the ministerial council. Spanish shipyard Navantia announced today that the keel of the future Turkish Navy Landing Helicopter Dock (LHD) has been laid at the Turkish shipyard of SEDEF (a member of TAIS Shipyards) in Tuzla, Istanbul. The vessel, which will be named TCG Anadolu, is based on Navantia's Juan Carlos I vessel already commissioned with the Spanish and Australian navies. The French defence procurement agency (DGA) has awarded Thales a 42-month contract to conduct a set of studies and technological developments for a sonar system to be equipped on France’s future third-generation nuclear-powered ballistic missile submarine (SNLE 3G). The Pacific fleet is likely to get four upgraded cruise missile nuclear submarines (SSGN) of project 949A by 2021, Deputy Defense Minister Yuri Borisov said. "We discussed the issue today and believe 2021 is a real deadline," he said during a visit to Zvezda shipyard in the Far East. Safran is one of the main participants in the OCEAN2020 consortium, which won a major contract as part of the European Commission’s 2017 Preparatory Action on Defence Research (PADR) initiative. This European Commission’s OCEAN2020 project, with 35 million euros in funding, aims to develop a technology demonstrator that will validate the concept of deploying a complete array of drone systems (air, surface and submarine) for surveillance in a maritime environment. General Dynamics Bath Iron Works (BIW) released a really nice video showing the future USS Michael Monsoor (DDG 1001) underway for acceptance trials. The U.S. Navy’s Zumwalt-class destroyer successfully completed those trials on Feb. 1. BIW crew demonstrated the ship’s systems to evaluators with the U.S. Navy. Rear-Admiral Vladimir Dmitriyev has been appointed Russian Pacific Fleet submarine force commander, the Eastern Military District’s press office said. "The Russian president has appointed Rear-Admiral Vladimir Dmitriyev Pacific Fleet submarine force commander," the press office said. The French Navy (Marine Nationale) nuclear-powered aircraft carrier Charles de Gaulle has received its radar upgrade. The SMART-S Mk2 radar was fitted on December 19, 2017 according to a Thales spokesperson. Charles de Gaulle is in dry dock since February 2017 for its mid-life refit following 15 years of operational deployments.